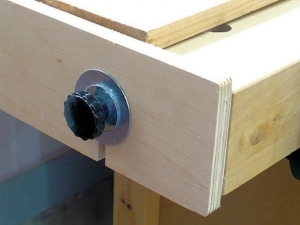 Homemade workbench planing and sanding stop fashioned from a length of surplus Birch plywood. 1/4" anchor bolts and plastic knobs with threaded brass inserts are utilized to position the stop as necessary. A great feature that just sits there dormant and out-of-the-way until needed. Brilliant.